I’m a teenager who chooses reality over simulation. I choose to light a fire in real life versus lighting a fire in Fortnite. I consciously make the decision that for 7 weeks every summer I give up all electronic screen-time for real-world activities that trigger all 5 senses in the human body. My friends from camp and I spend the summer playing archery and volleyball and everything in between. Eight years ago, my parents sent me off to Birch Rock Camp in Waterford, Maine for two weeks. I was ten years old and my brother was on his third summer staying for 7 weeks. When I got to camp that first day, I had to give up my Nintendo DS and my iPod. I spent two weeks swimming, playing cross camp capture the flag, crafting things in wood shop, playing basketball and baseball, building forts in camp craft, and it goes on and on. The next year I went for 4 weeks and knew that this is what I wanted to do during my summers. I could be home spending several hours a day playing video games, but instead I chose camp. All of these Xbox games I play are variations of real-life activity. Instead of playing basketball with my friends on XBOX live, I go to the court and play a pickup game with 7 of my friends. Game: Travel by sailboat across a sea. 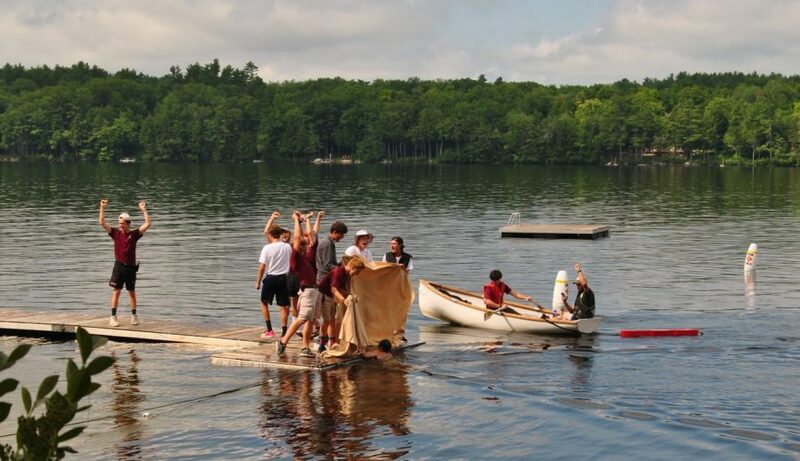 Camp: Sail a sunfish across Lake McWain. Game: Use my bow and arrow to compete against an opponent. Camp: Archery, get my American Archer Badge for shooting from 50 yards. Game: Swim across an underground ravine. Camp: Swim the lake from one end to the other and complete your Seal, a 2.5-mile swim. Game: Eat to increase your health. Camp: Pizza Friday, Taco Tuesday, and Fish Sunday. Game: Dress up with an avatar. Camp: Dress up in hilarious costumes for Saturday Night Skits. Game: Climb a mountain to see the entire map. Camp: Hike Mount Katahdin and see for 100 miles in all directions. Modern gaming allows the user to connect with multiple people to engage and participate in a virtual world, so they are not playing alone. This has taken gaming to a new level and really improved on the old style of playing by yourself. But camp is always about playing with your friends in real life. Every day is a chance to play a pickup game of soccer, basketball, baseball, or lacrosse. You can simulate an experience playing on your Xbox or Sony PlayStation. But does it really get your heart pumping, your breathing short, or provide that feeling of satisfied exhaustion after hiking for 15 miles? Video games are awesome, and I love playing them. But by January every year, I start counting down the number of days until camp starts. And for those seven weeks at Birch Rock, I’m digital device free and loving every minute of it.